Imagine your dog suddenly being lethargic and then the next thing you know they are completely paralyzed. You take them to the vet only to discover that they too are without any answers. Instead of leaving your beloved fur baby in misery, you make the painful choice to have them euthanized. But at the last moment, a veterinary student makes a discovery that changes everything. That’s exactly what happened to Ollie, a 10 year old Sheltie from Portland, Oregon. In a news release from DoveLewis, Ollie’s parents were at a complete loss when they brought him in to the hospital. He was unable to eat or go to the bathroom, and his quality of life was deteriorating fast. Despite their veterinarian ordering blood work, urinalysis and x-rays, there was no medical reason for his health crisis. The best they could do was administer medication, but that too proved to be ineffective. Al and Joelle Meteney made the decision to put Ollie to sleep. Dr. Adam Stone was to perform the end of life procedure. When he and his veterinary student Neena Golden were preparing Ollie, Neena went and hugged Ollie. She rubbed behind his ears and felt a rather large lump underneath his fur. It was a tick. Despite having a tick collar, the pest managed to attach itself to hi for quite awhile. Image A and B show the top and bottom view of the bloated tick found on Ollie. Image C is a sample of a regular sized tick. Dr. Stone quickly thought of a rare condition he learned about in vet school called “tick paralysis.” Tick paralysis is very rare (so rare he says that only one other vet professional at DoveLewis had seen it) but it can wreck havoc and become extremely debilitating. Essentially, it’s caused illness by a neurotoxin produced from the ticks saliva. The toxin is transferred to the host over an extended period of time. The good news is, it’s curable. 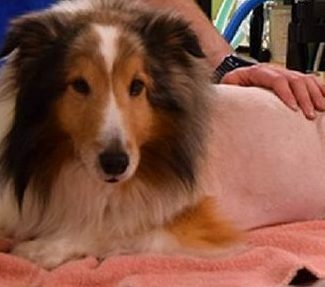 After discussing his new found diagnosis with Ollie’s parents, the hospital staff completely shaved his body to be sure there were no other ticks hiding in his fur. He was then sent home to be monitored. The result? Not even 10 hours later, Ollie was clicking his nails on the hardwood floor. He was up, running around and wanted to be let out to use the bathroom. Ollie is back to his old, lively and playful self. He’s ready for his next adventure, but his parents, plan to not only use a tick collar, but tick prevention medication as well. Have you ever known anyone’s pup to have tick paralysis? What was the experience like? Comment below and don’t forget to share! ← This Dog Stopped Breathing In The Park, Then Someone Comes Along And Does This. OMG.